Pam Hayes admits she was pretty naïve when she first took over operating the family’s custom-sewing business with her sister. Without a background in business, Hayes was unsure how to chart a course for the company her parents built. But today, Tote Along has not only survived an industry downturn, it thrives in Miami. The firm has tapped into numerous public and private resources, including the Oklahoma Manufacturing Alliance and Extension Agent Mike Mitchell. He is one of 17 MEAs working across the state to support industry. Mitchell is sponsored locally by Northeast Technology Centers. Hayes sees her company breaking the $1 million mark after only five years—that’s in an industry dominated by foreign competition and cheap labor. It’s a far cry from how it all began. Tote Along traces back to 1987 when Clark and Nan Bowman moved back to Oklahoma and purchased a whip company. The two traveled the horse-and-cattle circuit, and Nan’s sewing caught a few eyes, which created a few orders on the side. Boot bags and garment bags were sewn. Thus, the idea for Tote Along. A decade later, Pam and husband, Brett, came into the business and joined sister, Kay Devin, and husband, Randy. The daughters purchased the business in 2004 and grew it until 2008. At that point, increased international competition forced the company to drop one line and narrow others. To recover, the second-generation leadership for the first time sought help from the outside. Tote Along began to execute a myriad of strategies with the Manufacturing Alliance and other local economic development leaders. A grant from Southwest Trade Adjustment Assistance Center allowed the company to bring in strategic planning, financial, and marketing assistance. And the efforts paid off. From 2009 to 2012, Tote Along’s sales grew by 45 percent. Today, Tote Along has evolved and developed custom sewing of specialized products for law enforcement, manufacturers, and agriculture industries. Tote Along is truly one of the last successful custom sewing operations in the United States. All made in America—in Oklahoma. What could be better? 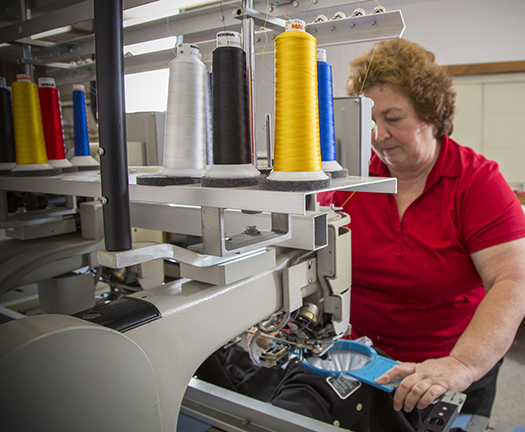 Tote Along in Miami has evolved and developed custom sewing of specialized products for law enforcement, manufacturers, and agriculture industries. Tote Along is truly one of the last successful custom sewing operations in the United States.